This tour is the combination of two popular winter programs: the Northern Lights Exploration and the North Iceland Aurora Challenge. Additionally we include a Northern Lights fjord cruise in Reykjavík. This 15-day escorted winter tour is designed to discover West, South and North Iceland and to maximize the chances of seeing the elusive Northern Lights. Included are a lot of cultural experiences and museums visits. You take part in winter adventures and activities: fjord cruise by day and night, snowshoe walk, volcano climb, torch hike to search for the Aurora Borealis and bathing in geothermal lagoons. IMPORTANT: The Northern Lights Discovery Tour is a combination of two popular one-week holidays. During the first week you travel with the Northern Lights Exploration group and on the second week you travel with the North Iceland Aurora Challenge group with a maximum of 16 persons. Most likely there is a different guide each week. Individual transfer by Flybus shuttle bus from Keflavik Airport to your accommodation in Reykjavík where you spend the night. We provide you with ideas how to explore Iceland's capital on your own. At 09:00 meet your tour guide who shows the group the highlights of Iceland's exciting capital. Then we head west. Borgarfjörður is known as the Saga valley because of its many important historical events. We get a chance to climb the Grábrók volcano crater and get warmed at Deildartunguhver, Europe's most powerful hot spring which produces 180 liters per second of water that is nearly boiling - 97° Celsius. Hraunfossar is a series of waterfalls pouring from beneath a wide lava field. Barnafoss – the Children's falls, is nearby with its own tragic tale. We spend two nights in Borgarnes, West Iceland. The afternoon includes a lecture about Northern Lights. After dinner, we step into the hotel garden in search of the Northern Lights followed by a hot cup of chocolate or tea. The Snæfellsnes Peninsula "the peninsula of the snowy mountain" juts out from Iceland's west coast, like a long arm with a clenched fist at its tip, and is in many ways a microcosm of the whole island. A rugged mountain chain runs its length. We travel to the charming fishing town of Stykkishólmur for a cruise in the Breiðafjörður fjord. After a light lunch a uniquely Icelandic "treat" awaits us at Bjarnarhöfn, where they make Hákarl - the fermented shark. Depending on road and weather condtions, we visit the fishing village of Grundarfjörður, a place with an impressive coastline and mountains, lakes and waterfalls behind the village. Jutting out into the bay rises one of the most photographed mountain in Iceland, Mt. Kirkjufell. On the way back to Borgarnes the guide gives you some practical tips on how to photograph the Auroras as part of the Northern Lights Academy program. Naturally, once darkness falls, we are out in the hotel garden to chase the Northern Lights and to soak in the hotel's outdoor hot tubs. Today we travel along the Hvalfjörður fjord. The first stop is at an Icelandic wool outlet store, just to see what they do with all those sheep! We continue inland to Þingvellir National Park, a UNESCO World Heritage site. We travel the Golden Circle route and see steam rising from the Geysir geothermal fields as we arrive. There is a variety of hot springs and bubbling pools. The original geyser is now dormant but has been replaced by Strokkur "the Churn" which erupts at 5-10 minute intervals. The chef of the Restaurant Geysir invites you to taste freshly baked hot spring bread served with Icelandic butter, geothermally boiled eggs and herring. It is best served with a small glass of Geysir Schnapps, very cold – nearly freezing. On we travel to Gullfoss, a double waterfall that tumbles 34 meters into the Hvítá river and attracts tourists and travellers in summer and winter. In the afternoon, you learn about the Icelandic horse, its special qualities and history and visit a geothermal greenhouse, before we reach the accommodation in South Iceland. Tonight, step into the darkness and search for the elusive Northern Lights, while best enjoyed from a comfortable hot tub in the garden of the hotel, amidst the peace and stillness of rural Iceland. Today we travel along the South coast. At the Eyjafjallajökull Information Center we learn about living next to a glacier and an active volcano. Further east we visit one of Iceland's finest folk museums. This museum contains an outstanding collection of farm and domestic artifacts from Iceland's past and several turf-built houses. Nearby is Skógafoss waterfall which is 60 meters high and one of the most impressive waterfalls in the country. In the afternoon we take a stroll on the black lava beach and along bird cliffs at Reynisfjara in South Iceland. We spend 2 nights near Kirkjubæjarklaustur in the Vatnajökull National Park region, located in complete darkness and ideal for Northern Lights search. Today's program is all about glaciers, ice and icebergs. We travel to Jökulsárlón, a glacial lagoon filled with floating icebergs, and we explore the extraordinary site and might see seals swimming in arctic waters. You can walk on the black sandy beach where large icebergs get stranded. In the afternoon we visit the tiny turf church at Hof and spend time at Europe's largest national park, which has Iceland's highest mountains, an alpine environment, and Europe's largest glacier. In the evening enjoy a film presentation about the Northern Lights as part of the Northern Lights Academy program. Be careful not to go to bed too soon in this remote and quiet location or you may just miss out one more chance of seeing the Northern Lights shimmering and dancing across the night sky. From Kirkjubæjarklaustur we head across the Eldhraun lava field to the village of Vík, where we make a photo stop. The black lava beach with high bird cliffs and pounding waves is very impressive. Further west we reach the high but narrow Seljalandsfoss waterfall which plunges from the mountain. There is a trail that goes behind the falling water and offers interesting views, if you are prepared to get wet! In the afternoon we return to Reykjavik and have about 2 hour leisure time to explore Iceland's capital on our own, visit museums, do some shopping or simply rest after all this touring. In the evening we get to soak in the famous Blue Lagoon, followed by an Icelandic dinner at the Northern Light Inn Hotel and followed by one last nocturnal tour to seek more Northern Lights. Around midnight we reach Reykjavík, where you stay 2 nights. Enjoy a leisure day for exploring Iceland's capital, visit museums, do some shopping, go for spa treatments or take an optional whale watching tour. Included is an evening Northern Lights hunt by boat to escape the city lights. Please note, that if the tour is cancelled due to weather conditions, no refund is available but you can use the tour voucher for dinner at Kopar Restaurant at the harbour. Start the second part of the tour and travel west. Meet your tour guide and travel west, passing the town of Borgarnes and climb again the Grábrók volcano crater. We visit a natural history & seal museum and further north we stop at the turf church of Víðimýri. We travel along scenic fjords and over several challenging mountain passes until we reach Siglufjörður, Iceland's northernmost town. We overnight at the new and beautifully located Hotel Siglo which offers spectacular geothermal hot tubs built into the local fjord. In the evening, if weather permits, we take a little walk or drive to search for the Northern Lights. In the morning we explore Siglufjörður, Iceland's northernmost town, known as the herring capital of the North Atlantic. In Siglufjörður we visit the herring museum, the largest seafaring and industrial museum in the country. In the afternoon we drive along Eyjafjörður, Iceland's longest fjord which offers an amazing mountain panorama and explore Tröllaskagi Peninsula. Along the way, we stop at a deserted fjord valley that even most Icelanders have not yet seen. Later we stop at a local brewery and taste one of Iceland's micro-beers. We continue to Lake Mývatn, a winter wonderland, where we stay for 3 nights. Join an evening lecture about Northern Lights and don't miss the chance to search for the magical auroras after dinner. This morning we go for a snowshoe trip (or a normal hike if there is no snow) through the lava formations of Dimmuborgir "the dark castles", hoping to get a glimpse of the trolls who are said to live there. The afternoon is free at leisure to explore the many pseudo craters or walk along the lake shores. Also available is an optional tour on cross-country skis or snow-mobiles. In the evening we take a relaxing soak at Lake Mývatn Nature Baths and get ready to chase the elusive Northern Lights. Lake Mývatn is known for its geological wonders and active bird life, but also for having Iceland's coldest temperatures. We take an easy walk through the bizarre lava formations and landscape with great views to the lake, bird life and trees. Later we explore the hot spring area of Námaskarð with bubbling mud pools and steaming solfataras. We taste traditional dark bread baked underground in the geothermal heat. 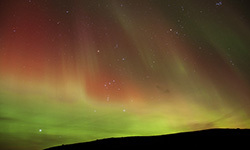 In the evening enjoy a video presentation about Northern Lights as a part of the Northern Lights educational program. After a delicious dinner, don't forget to keep an eye out for the Northern Lights. We visit the Lake Mývatn bird museum and travel to Goðafoss, the waterfalls of the Gods. Next stop is the Christmas Garden, a small museum and shop where you find countless items connected to Icelandic Christmas traditions. The afternoon is free at leisure to explore Akureyri, the capital of North Iceland on your own. There are some excellent local museums and a great geothermal swimming pool. Depending on weather there is a short excursion into the darkness to hunt the Aurora Borealis. We travel back west over the mountains to Skagafjörður, the valley of horses and home of many ancient farms. We visit the folk museum and turf farm at Glaumbær. Enjoy a guided tour through the only tannery in Europe which makes fish leather. Later we stop for coffee & cake at a horse farm, where we learn about the history and the special gaits of Icelandic horses. 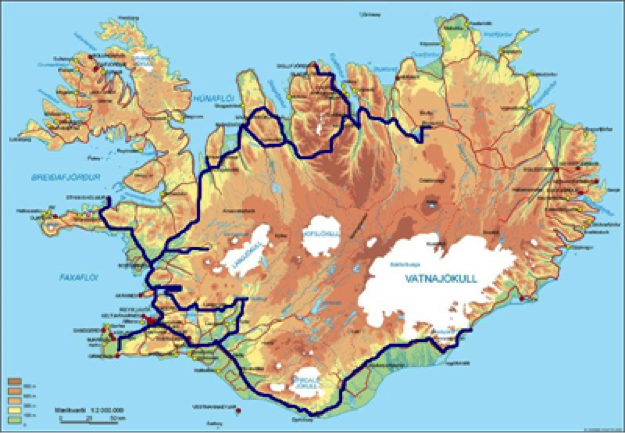 We reach Reykjavík depending on weather and road conditions between 18:00-20:00 where you stay one night in Iceland's capital. Note: there is limited day light, about 5-6 hours, between mid November to end of January. The shortest day in Iceland is the December 21, about 4 hours. EXTRA COSTS FOR DINNERS TO BE PAID AT THE HOTELS: First week: Fixed 2-course dinners with fish, meat or vegetarian main courses available at the hotels from ISK 6.000 (about EUR 45) pp/nt. Country hotels don't offer a la carte meals. There are no other restaurants nearby. Paying for a 2-course dinner directly at the hotel is less expensive.